A scene from the film, which depicts a week in the life of Kashu Mainichi founder Sei Fujii. 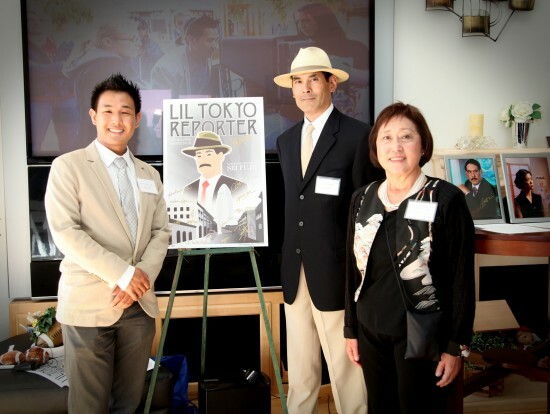 PASADENA — “Lil Tokyo Reporter,” a film inspired by the life and contributions of a historical newspaper publisher, will have its premiere showings at the Laemmle Theater, 673 E. Colorado Blvd. in Pasadena, on Friday, Saturday and Sunday, Sept. 14, 15 and 16, with two showings starting late in the morning. “Lil Tokyo Reporter” covers a week in 1935 Little Tokyo, where Sei Fujii, a pioneering Issei newsman who confronted corruption that threatened the livelihood of Little Tokyo. The premiere showings will include a Q&A with the director and cast, and a reception with light refreshments. The price of admission is $9 general, $7 for seniors and students. Directed by Jeffrey Chin and executive-produced by Carole Fujita, the film features lead actor Chris Tashima, who directed and starred in the Academy Award-winning drama “Visas and Virtue”; actress Keiko Agena (“Gilmore Girls”); actor Eijiro Ozaki (“Letters from Iwo Jima”); and other noted actors from Japan and America. Fujii came from Japan in 1903 and graduated from USC Law School in 1911, but could not become a lawyer because he was not a citizen. He teamed with a classmate, civil rights attorney J. Marion Wright, to assist the Japanese community on racially discriminatory legal problems and issues for over four decades. Together, they won a U.S. Supreme Court case in 1928 that allowed Japanese doctors to construct the Japanese Hospital of Los Angeles. In 1952, they won a California Supreme Court Case overturning the California Alien Land Law. For showtimes, call (310) 478-3836 the week of the premiere. For more information on the film, visit www.ltreporter.com or www.facebook.com/liltokyoreporter. From left: Jeffrey Chin, Chris Tashima and Carole Fujita are the team behind "Lil Tokyo Reporter."